Meanwhile, heat oven to 350°F. Spray 13x9-inch (3-quart) glass baking dish with nonstick cooking spray. Melt margarine in 12-inch skillet over medium heat. Add asparagus and mushrooms; cook and stir 5 to 7 minutes or until asparagus is crisp-tender. Pour into large bowl; stir in ham. Set aside. In same skillet, combine 1/2 cup of the milk, flour, bouillon, pepper and Dijon mustard; blend well with wire whisk. Add remaining 1 1/2 cups milk; blend well. Cook and stir over medium heat until mixture is bubbly and thickened. 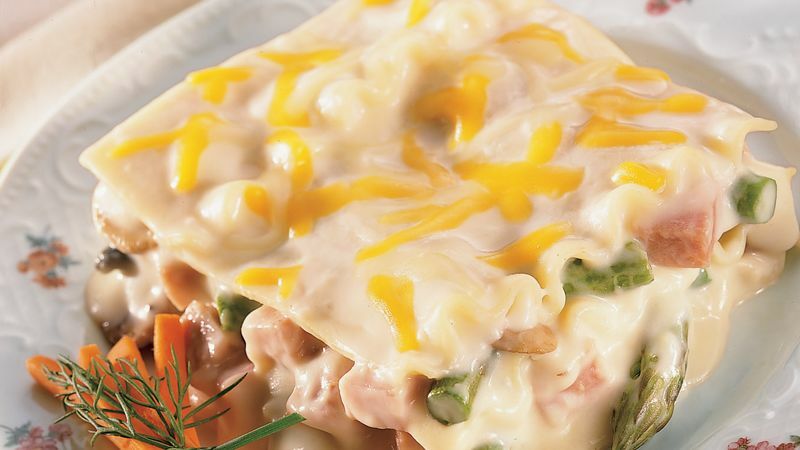 Remove from heat; stir in 1/2 cup of the cheese until melted. To assemble lasagna, spread 1/2 cup sauce evenly in bottom of sprayed baking dish. Reserve 1/2 cup sauce for topping. Add remaining sauce to ham mixture; mix well. Arrange 3 cooked noodles over sauce in baking dish. Spoon and spread half of ham mixture over noodles; top with 1/2 cup cheese. Repeat layers. Top with remaining noodles and reserved 1/2 cup sauce. Sprinkle with remaining 1/2 cup cheese. Bake at 350°F. for 20 to 30 minutes or until bubbly. Let stand 15 minutes before serving.